T he gold rush was on this morning at Apple stores in the U.S. and Europe as iPhone buyers waited in line for days to be the first to own the gold-colored iPhone 5S. But, now, thousands have been left empty-handed and Apple stores have sold out of the highly coveted smart phone. Desperate Apple fans need not despair for too long. AT&T’s online store just listed a shipping time of 21 to 28 business days for the gold model. Meanwhile, all three varieties of the gold phone — with 16GB, 32GB, and 64GB of storage space — are backordered until October in the Apple Store. Apple apparently apparently noticed the demand disparity early and the company asked suppliers to increase production of gold iPhone 5S components, the Wall Street Journal reported. 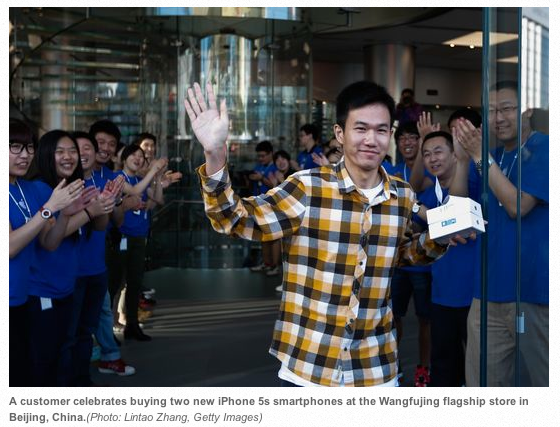 In China, the iPhone 5S has been available for preorder since Tuesday. 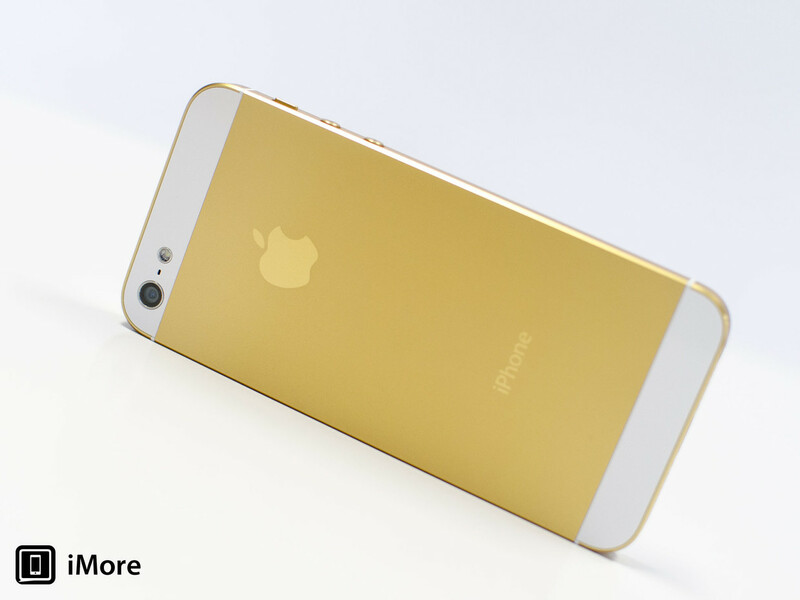 Chinese news outlets reported that retailers have already sold all of the gold iPhone 5S models they had in stock. Gold is a wildly popular color in China and India, countries where Apple is hoping to capture a larger slice of the smartphone market. The shortages were seen as a bit of good news for Apple on Wall Street. The company’s stock, which dipped after Apple unveiled the 5S and a separate, lower-cost iPhone called the 5C, rose slightly Friday morning. At the Apple Store in Manhattan’s Grand Central Terminal, a store employee said they had run out of gold iPhones “early this morning,” long before the store opened at 8:00 a.m. — made possible by a system where customers at the front of the line selected tickets for their phone of choice while waiting. At Grand Central, the line began outside the station. Customers were shepherded inside in groups, bound for a tunnel where a holding area awaited them. Once at the front of that line, tickets in hand, groups of customers were escorted into the store to make their purchase. 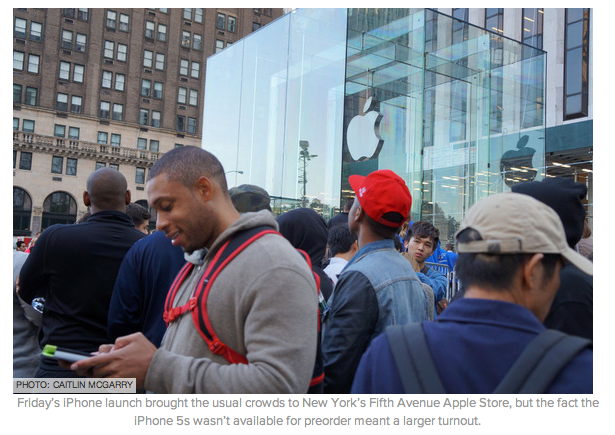 The scene at the Fifth Avenue Apple Store in Manhattan was one of ordered chaos. Dozens of reporters — including Carson Daly — were there, interviewing weary Apple fans who had spent the night waiting in line. About a dozen Apple Store employees, clad in blue shirts, riled up the front of the crowd by starting waves. Security guards with dogs patrolled and kept order, and NYPD officers had a table set up to encourage people to register their new devices. By 7:30 A.M., 30 minutes before the store opened, the line of people — not including the rows snaking near the iconic glass cube entrance to the store — stretched for more than a quarter of a mile. I’ve not yet ordered the new iPhone. As a die-hard Apple fan, I am usually in line for new products. But, this one hasn’t impressed me much yet. Let me know if you managed to get your hands on one and if it really is worth all the hoops to get it. In the meantime, you gotta hand it to Apple. They knew the “sold out” news would spread like wildfire creating even greater demand for the new iPhone. They could have stocked their stores and suppliers like Best Buy with enough product. But, headlines about sold out phones and fans insisting they will do anything to get their hands on the impossible-to-get item are always effective. Everyone who thought the days of smart Apple marketing died with Steve Jobs, clearly underestimated the lessons his team learned from the master himself.